It's no surprise that after I read a cookbook, I want to run to the kitchen and start cooking. But, something different happened when I read The Mozza Cookbook a few months ago. Yes, there were some recipes that lured me toward the stove, but the book also really made me want to visit Mozza in Los Angeles. I'll need to plan this visit with a group because I imagine I'll want to taste just about everything from the mozzarella bar, the antipasti, several pasta dishes, pizzas, salads, contorni, and probably every single dessert. I love cooking Italian food, but the thought of sitting down to the kind of feast I'd enjoy at Mozza is dreamy. I couldn't even decide which pizza I'd try first. There's one topped with squash blossoms, tomato, and burrata, another with funghi misti, fontina, taleggio, and thyme, and the bianca that's spread with whipped cream as a thick sauce and topped with fried sage leaves and cheese. I want to try making the fresh pasta dough from this book since it contains even more egg yolks than my current go-to recipe, and I want to try shaping orecchiette and garganelli. But, of course, the dolci chapter is what I cooked from first. This book is by Nancy Silverton, which means the desserts are all going to be fantastic. I simplified the strawberry and fig jam crostate by skipping the little meyer lemon panna cottas that were to sit on top of each and the saba that should have been drizzled over the panna cottas. Instead, I served these mini crostate with whipped cream with creme fraiche. You should start by making the jam because that can actually be made up to a week in advance. 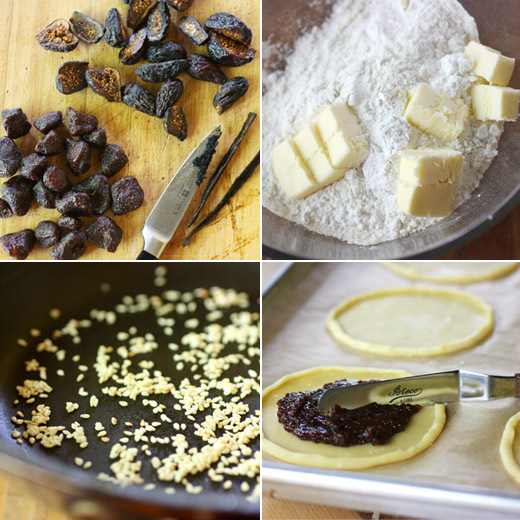 You combine stemmed and halved dried figs and dried strawberries in a saucepan with sugar, lemon zest and a vanilla bean and the seed scrapings. Water is added to cover, it's brought to a boil, and then it's left to simmer for 30 minutes. After the mixture cools, the lemon zest and vanilla bean are discarded, and the rest is pureed in a food processor. The jam is then refrigerated. Next, the dough is made for the crust. As the recipe is written in the book, it's suggested to be made in a stand mixer. I cut the quantity in half, and mixed the dough by hand since it was a small amount. So, flour, confectioners' sugar, butter, baking soda, baking powder, and salt were worked together until the mixture formed a coarse meal. Two egg yolks and some vanilla extract were added along with some toasted sesame seeds and mixed until the dough was smooth. The dough was wrapped in plastic and refrigerated for an hour before proceeding. The dough was then rolled out to a thickness of about one quarter inch, and six five-inch circles were cut from it. The dough circles were placed on a parchment-lined baking sheet. Then, the edge of each circle was rolled in just once to form a tiny edge. The dough scraps were to have been rolled by hand into thin ropes, but the dough kept breaking when I tried that. Instead, I kneaded the scraps together, rolled it out with a rolling pin, and cut thin strips to use for the lattice tops. 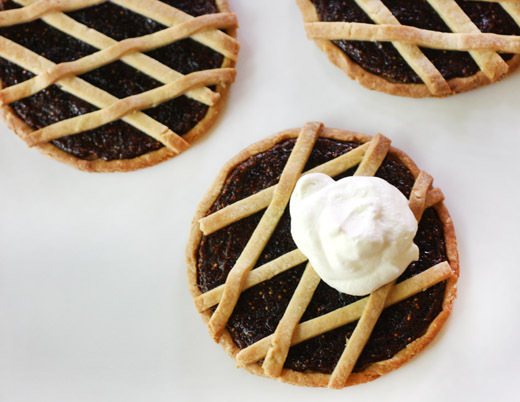 The dough rounds were spread with the strawberry fig jam and topped with lattice dough strips in a diamond pattern. The baking sheet with the crostate was chilled before being baked for about 25 minutes. What I loved about these crostate was that they're kind of like a cookie and kind of like a tartlet. They're sturdy enough to pick up and eat with your hands and pretty enough to be served on a plate with whipped cream. There's more I want to attempt from the dessert chapter, but next, I'm ready to try my hand at some pasta shapes I've never made before. Marvelous crostate! That jam is so original. these are adorable and look delicious!!! i love any 'seedy' jam and this looks extra 'seedy', yum! If you ever want a going-to-Mozza partner, I will gladly get on a plane and head over there with you! These crostate look delicious. I love fig-full desserts! I have been looking for fig jam for a cheese I found at Pike Place Market. Gorgeous as usual, Lisa! I have two new Italian cookbooks and there are so many fabulous recipes I want to make...especially trying to make pasta and crespelle and gnocchi - but I always end up making desserts! Your crostate - I love crostate - are beautiful! Those are such beautiful little desserts, and the flavor sounds terrific! I could definitely go for those too. Beautiful, elegant dessert. Your pastry looks perfect also! That sounds like a really interesting place. I particularly want to visit their pizzeria, wanna go together? I love these cookies/tartlets. They look so cute. This crostate sounds delicious, figs and strawberies, a very interesting combo! 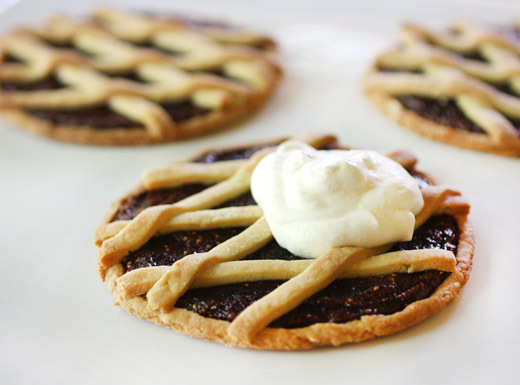 whether baked in a crust or eaten by the spoonful, that jam is awesome! This is my kind of dessert! Pairing figs and strawberries is a tempting combination. I can only imagine each luscious bite of fruit surrounded by the rich crust. A stellar recipe. Another cookbook for my ever growing list! Oh, I would totally go to Mozza with you! The food is fantastic! So sweet and dainty, perfect for a little girls tea party!! These are some lovely petite tarttlets! These are so very pretty. I would hold the cream and just eat the pastry though. Looks heavenly!